Russian President Vladimir Putin said he “couldn’t care less” that US law-enforcement officials accused Russian nationals and entities of meddling in the US election. Special counsel Robert Mueller charged a notorious Russian “troll factory” and 13 Russian nationals last month with breaking US law and interfering in the 2016 presidential election. Putin fired back at those allegations last week, saying the underlying conduct did not violate Russian laws. Russian President Vladimir Putin brushed aside US accusations that Russian individuals and organisations had meddled in the 2016 US election to help boost Donald Trump and hamstring his political opponents. The investigation of that meddling is part of several inquiries being conducted by special counsel Robert Mueller and congressional committees. Among the preliminary findings, US prosecutors said a notorious Russian “troll factory” known as the Internet Research Agency (IRA) focused on sowing political discord in the US via social-media platforms and through the dissemination of pro-Trump propaganda, which included made-up stories disguised as news articles. In an interview with NBC News’ Megyn Kelly that aired Friday night, Putin said he “couldn’t care less” about the charges. “So what if they’re Russians? There are 146 million Russians. So what? … I don’t care. I couldn’t care less. … They do not represent the interests of the Russian state,” he said. The US social-media sites Facebook and Twitter have publicly acknowledged that Russia used their platforms to spread political antipathy. Facebook said fake accounts “likely operated out of Russia” bought thousands of ads that were seen by an untold number of people during the 2016 election. Twitter said in January that it found thousands of Russia-linked accounts that shared election-related material. Trump had interacted with some of those accounts hundreds of times. 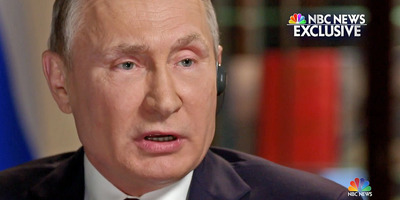 Putin was similarly dismissive of Russian meddling accusations during a segment of his NBC News interview that aired last week, when he said the actions of the accused Russian operatives did not violate Russian laws. He reiterated that line on Friday night, saying he wants to see proof that Russian nationals were involved. “At least send us a piece of paper,” Putin told Megyn Kelly. “Give us a document. Give us an official request. And we’ll take a look at it,” he said. The Russian president has been resolute in his assertion that Russia did not interfere in the US political process. Trump, who won in November 2016 in a surprise victory against his Democratic opponent Hillary Clinton has, in fits and starts, acknowledged that some meddling occurred during the election, but he has been noncommittal about pointing fingers at Russia specifically. Additionally, Trump has denied any wrongdoing, as have several of his current and former campaign associates. But, on top of the charges against Russian nationals and entities, Mueller has also charged multiple others who were connected to Trump’s campaign. Those people include Trump’s former campaign chairman, Paul Manafort, and Manafort’s longtime business partner, Rick Gates. Former campaign adviser George Papadopoulos and ex-national security adviser Michael Flynn have also been charged. All are cooperating witnesses in Mueller’s Russia probe, except for Manafort who has pleaded not guilty to the charges he’s facing. Mueller’s investigators are looking into whether Trump or his associates colluded with Russia, and Mueller is also building an obstruction of justice case in relation to Trump’s actions as president, including his firing of FBI director James Comey in May 2017. Mueller may be getting closer to sitting down with Trump himself. The president’s lawyers have spent months negotiating terms for such meeting.